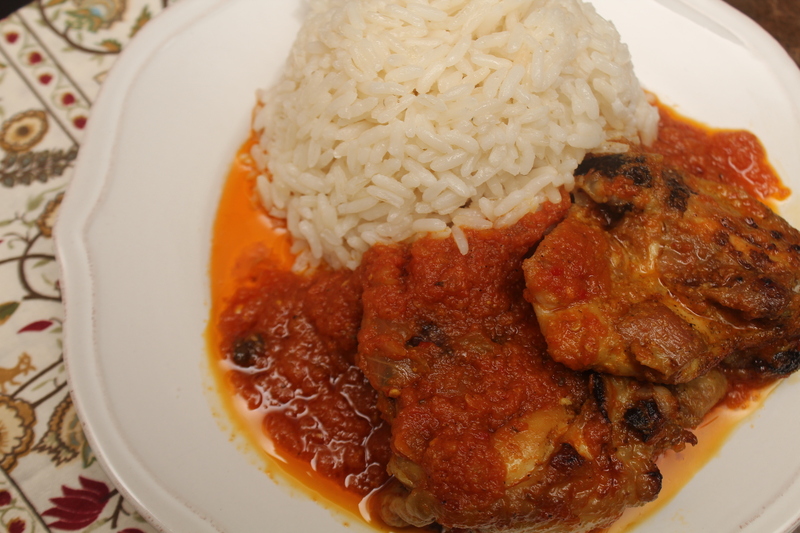 The Nigerian tomato stew is a favourite go-to sauce and in my opinion the most versatile of all the sauces and stews in the region. It is always in my fridge to enhance the taste of a quick snack or to pair with rice, plantain, yam potatoes freshly grated okra with eba for dinner. A vegetarian option with no meat or fish. Start by blending the tomatoes, bell peppers and habanero peppers along with one of the onion. Heat up a heavy base pot and pour in the oil to heat up to at least 350F if you do not have a thermometer, I sometimes throw in the a strand of an onion peel in. If it sizzles then it is hot enough if it does not, allow to heat up a little bit more. Fry the onion in the hot oil until it is sought of crispy outside but must be soft at the centre (If you get this bit right, you would be rewarded with that pleasant aroma from frying onion and everyone around would definitely notice that something smells nice). Pour in the blended tomatoes and cook uncovered for about 20- 25minutes over medium heat (this is frying the tomato mixture to allow moist of the moisture to evaporate) Stir occasionally. Now it is time to stir in the herb and spices. I do this now as I do not want to lose much of the flavours of my spices and herb while tomato mixture is cooking. So I always put them in the half way mark. Allow to cook with the spices and about one teaspoon of salt for another 10minutes before adding your chicken and reduce heat to a gentle simmer for the rest of the cooking. That should be approximately 15 minutes. Taste for salt and pepper and adjust accordingly. 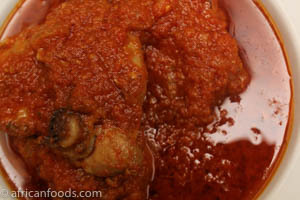 Nigerian Stew Ideas, Questions & Comments: Have Your Say. 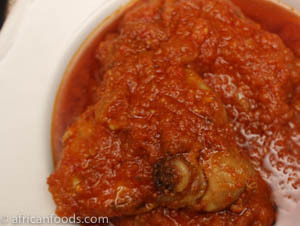 Do you have a great and original Nigerian stew recipe idea? Have a question on how to prepare this delicious stew, or where to get ingredients, or just want to leave a view or comment? Share it here!